I’m not a big fan of Starbucks -- I can’t drink their espresso straight because it reminds of that taste I would get in my mouth when I was a kid and chewed on pencils. It’s sort of wood, paint, and possibly lead flavor that isn’t really conducive to that relaxing moment during the day. I drink my Starbucks like most people -- with a lot of milk. My standard drink is a double-tall-non-fat latte. Every now and then I get it with whole milk because the fat hides the bitter extraction they call espresso. Then there’s the fact that Starbucks looks like Starbucks wherever you go. They have the same advertising, although it might be in another language, but it’s the same picture on the same sign in London or Germany. They play the same music everywhere but, honestly, it’s wide enough mix it’s never bothered me. And there’s that same burnt coffee smell that is quintessentially Starbucks. People say Starbucks is the McDonalds of coffee, but McDonalds actually has more variation in their stores and menus from country to country. No matter where you go, Starbucks is… Starbucks. 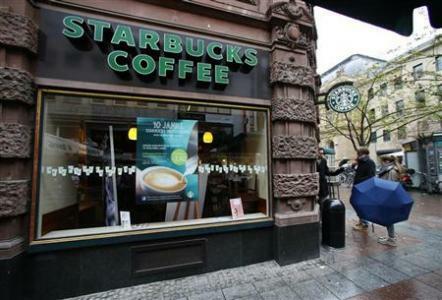 So, you may ask, when I’m in Europe, why do I get excited when I see a Starbucks? Free wi-fi. I don’t travel with an international data plan. Maybe I’ll buy a pay as you go phone if it looks like I’m going to keep spending one or two weeks out of the month in Europe, but it’s just too damn expensive to turn on my phone in Europe even if I have an international plan. So I seek out free wi-fi. Getting online is very important to me when I’m travelling; not just for work but for personal sanity. I’m a talker, you see, a man of many words. So many words that I have to spew them out into a blog from time to time, especially if I can’t strike up a conversation with the stranger next to me at a coffee shop or bar. Languages like German and Norwegian are particularly frustrating for me -- it almost sounds like English, but the kind of English you hear when you’re drunk or stoned and the words flow by without meaning, with individual words occasionally surfacing without context. So, I go to Starbucks. I order my double-tall-non-fat latte, and find a corner, preferably with a power outlet. Then (after figuring out the local login process), I immerse myself in words I do understand, and spew a few words of my own on a blog or Facebook. I don’t go to Starbucks when I’m in Europe, you see, I’m taking a break from Europe. I’m in Starbucks.